There is a growing atmosphere of hatred in which anyone who opposes the current government is labeled the ‘worst sort’, or even ‘Soviet murderers’. The place in Warsaw where Piotr Szczęsny set himself on fire. Wikicommons/ Mateusz Opasiński. Some rights reserved.Thursday October, 19 at 16.30: An ordinary day, an ordinary man stands on the steps of the Warsaw Palace of Culture and Science. He is reading something through a megaphone to inattentive passers by. Just another protesting voice in the Polish capital. Except, once finished, this 54 year old man, who would become known for some time simply as Piotr S., then sets himself ablaze, performing an act of self-immolation to the sound of a song by ‘Chłopcy Placu Broni’ coming from a tape-recorder. ‘Freedom. I love and understand freedom. I don’t know how to give it up…’ On the ground lie strewn the pieces of paper from which he had been reading – a manifesto outlining 15 points of protest against the ruling Law and Justice Party (PiS). Ten days later, on October 29, he dies in hospital. It begins to sink in that this was a decisive, considered and dramatic political act. Where at first the media and politicians stay largely silent, following his death they now rush to assess his sanity, his past and his intentions. All this he foresaw. He openly admitted that he struggled with depression for eight years – but this was nothing to do with that, though he knew politicians would try to make it so. Depression does not equal derangement. So how should he be understood? 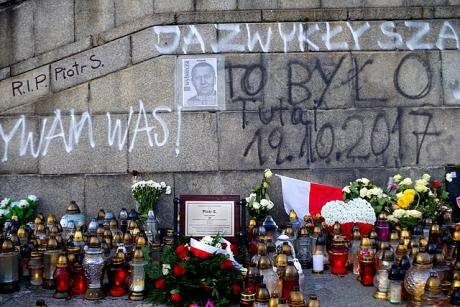 Piotr Szczęsny, as his full name was revealed to be post-mortem, chemist, former youth Solidarity activist, and management trainer for NGOs, had on that grey ordinary day travelled up to Warsaw from his home in Niepołomic, a small town near Krakow in the South of Poland. 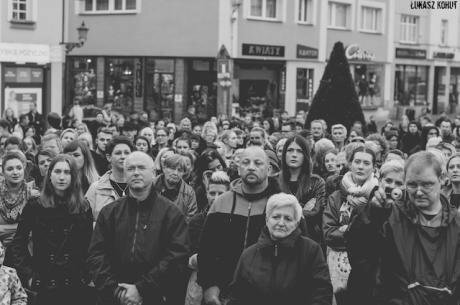 130km west, in a small town called Rybnik in Upper Silesia, a group of active citizens, known as the Silesian Pearls have for the last year been mobilizing local protest in order to try to hold back what they see as the ruling party’s authoritarian agenda. They were stunned by this event. ‘Poland is on fire’ reads one of their slogans. They did not think the metaphor would become personified. Yet Jola Jackiewicz, 57, co-founder of the Silesian Pearls, tells me she was less surprised, more deeply saddened; she had anticipated tragedy sooner or later. Outside of Warsaw, daily reality is too often treated as peripheral and insignificant. But it’s here where the tense effects of nationalist, hardline rhetoric can be felt most keenly. Piotr was far from a ‘provincial’ man – in the condescending, stereotypical sense – but maybe the environment in which he lived also played a part in making him feel isolated or perhaps suffocated. Outside of Warsaw, daily reality is too often treated as peripheral and insignificant. But it’s here where the tense effects of nationalist, hardline rhetoric can be felt most keenly. Protests that have occurred in Rybnik, co-organised by Silesian Pearls and other pro-democracy groups. This is of a rally in defence of the Judiciary. Photo by Lukasz Kohut, quoted above. All rights reserved. For Jola, the hardest part is how deeply divided people have become, even family and friends. There is a growing atmosphere of hatred in which anyone who opposes the current government is labeled the ‘worst sort’, or even ‘Soviet murderers’. Open and fair debate is impossible where public discourse has stooped so low. Silesian Pearls aims to change that by providing means for dialogue, political conversation and citizen education, something Jola feels has been neglected for too long. In order to love freedom you must understand what it means. Jola is of the same generation as Piotr. Like him, she feels an unsettling sense of deja vu. She lived through the days of the Polish People’s Republic, the closed-in world, the dictatorial rule, she knows, like Piotr, what not having freedom feels like. Wake up! It's not too late yet! Piotr’s 15-point list of grievances is measured and articulate. It could have been written by the Opposition or by the stronghold of protestors, like the Silesian Pearls, who align themselves with his urgent perspective, drawing attention to the government’s increasing restrictions on civil liberties, attacks on the Constitutional Tribunal, attempts to politicise the judiciary, breaking of the Consitution, marginalisation of Poland on the international arena, destruction of the Bialowieza Forest, the rise of xenophobia, the political use of hateful language, discrimination of minorities, and the propagandisation of state television and radio. 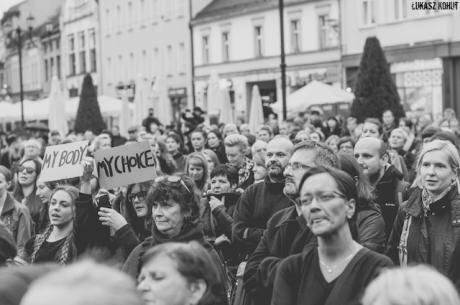 Another protest photo taken in Rybnik by Lukasz Kohut, this time of a women's rights march against the anti-abortion law. All rights reserved. What Piotr S. did is to highlight that there is a moment to say no – and this is it.